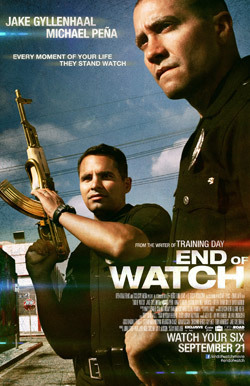 End of Watch Movie Trailer. Jake Gyllenhaal, Michael Pena and Anna Kendrick star in the ‘first-person’ cop drama from the writer of Training Day. Watch the movie trailer for End of Watch below. The action unfolds entirely through footage from the handheld HD cameras of the police officers, gang members, surveillance cameras, and citizens caught in the line of fire to create a riveting portrait of the city’s darkest, most violent corners, the cops who risk their lives there every day. MPAA Rating: (R) for strong violence, some disturbing images, pervasive language including sexual references, and some drug use.